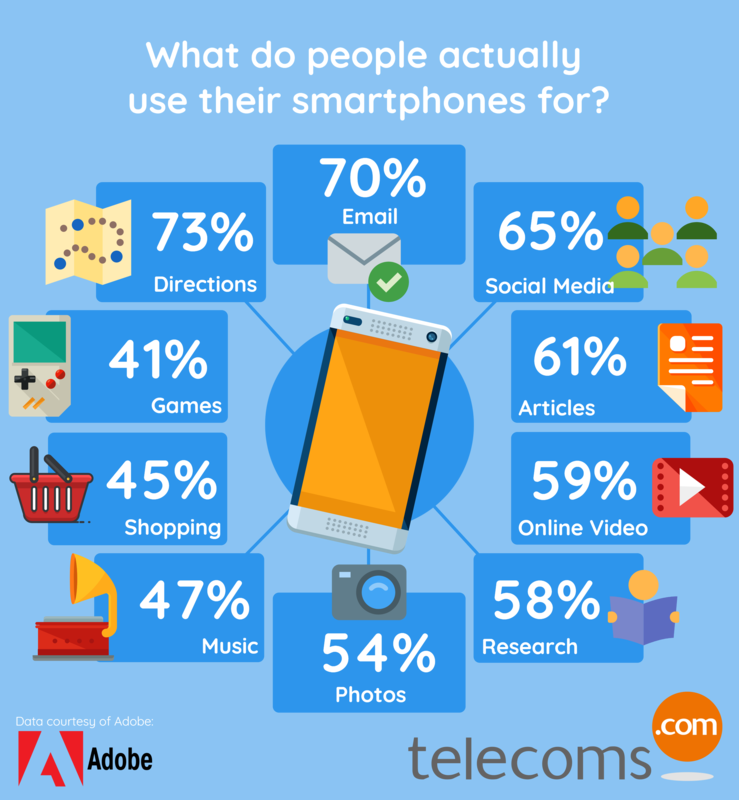 Infographic: What do we actually use our smartphones for? We all see more and more people glued to the blue-screens for an increasing amount of time, but what are they actually doing on there is they aren’t talking to anyone? Thanks to Adobe, we have a bit of a clearer idea. Now, the primary use of a smartphone will be to either call someone or send a text. That is a given, although calling seems to becoming an increasingly unpopular way to communicate, so these haven’t been included. But what is clear is that the smartphone is fast becoming the centre of our lives. In days gone, an A-Z might have been a fixture in everyone’s car, or an Argos catalogue in everyone’s cupboard, but no more. It will surprise no-one, as it is a trend which has been developing for years, but multi-purpose nature of the smartphone is here and now. The infographic at the bottom of the article will reveal what people actually use their smartphone for. What we might expect to see over the next couple of years is the phone as a means to pay (replacement for debit cards? ), this trend has already started, and also a wider influence on banking full-stop. But what next? How about an ignition tool for your car? Or a smart lock for your home which can be used to authenticate identification and allow entry to people? Travel is also heading the digital way, how long before paper tickets or boarding passes are completely eradiated? Although not included in this infographic, some of the same uses are surprisingly low on PCs. For example, only 43% of people would say they use their laptop for social media, and 37% for games. Perhaps somewhat surprisingly, only 30% has said they would use a tablet for shopping and only 36% to watch online videos. The death of the PC has long been discussed, but is the increasing size of a smartphone making the tablet redundant? I’m immediately skeptical of this when I see the most used is ‘directions’……. I can imagine it’s popular but social media, videos, etc. are all items that are immediately obviously from even a cursory glance (in any location worldwide) when looking at people head down in their devices!